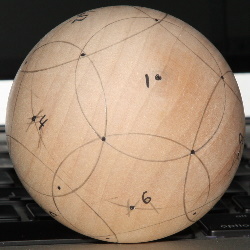 Laying out the points on a sphere is pretty straight forward. But keep in mind that although it's very exact on a piece of paper, it's less so on wood. You'll be fudging things a bit here and there. And it's okay. Just determine points from more than one other point and mark the spot in the middle of the various possibilities. Primary - 12 points that often make up the largest holes in your balls. These are the most common points to lay out. Satellite - The satellite, or constellation points, are the 5 points that circle each of the primary points. Because each satellite point is shared 3 primary points, there are a total of 20 of them. These points are usually optional and are added mostly for appearance. They're usually only drilled through the outside ball and sometimes the outside 2. Main - 6 points. Top, bottom and 4 'sides'. 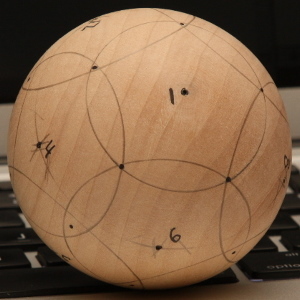 This is the layout used when making a cube inside of a sphere. Clearance - When cutting the 6 main points it takes quite a bit of reach for the hollowing tool to reach the center point between them. 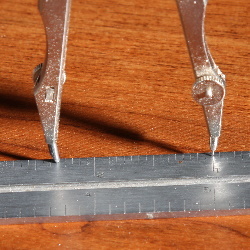 Often 8 clearance points will be drilled to make this task easier. Note: There are no hard and fast rules about which points get used for what. Many of the projects we discuss use the primary and satellite points or they use the main and clearance points as focus and secondary points. This doesn't have to be the case. You could mark out the 12 and 20 points and then make the 20 points the larger holes and the 12 points the smaller holes. The same can be said of the 6 main and 8 clearance points. I can't promise that you won't run into challenges, but once you figure out how this whole sphere thing works, let your imagination be your guide. 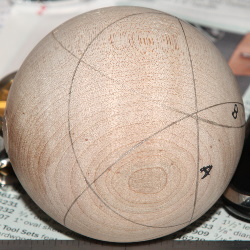 1 Start out by marking the most obvious end grain point on the sphere. Number it as #1. 2 Set your compass to 1-5/16". 3 Mark a circle from point #1. We'll call this circle A. 4 Mark another circle from any point on circle A. We'll call this circle B. Circle B will cross point #1 and will cross circle A twice. 5 From each point where circle B crosses circle A, mark another circle. Repeat until you have 5 circles centered on circle A and 5 points on circle A that are each the intersection of 3 circles. These are the 5 primary points around point #1. 6 You should also now have 5 additional points that are each the intersection of 2 circles. 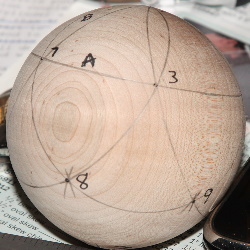 These are the 5 points around what will be point #2, which is the opposite end grain point from point #1. 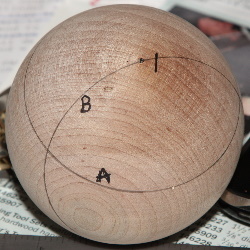 7 From each of the points that are the intersection of 2 circles, that is, the lower 5 points if you consider #1 to be the top point, mark an arc to determine the other end grain point. 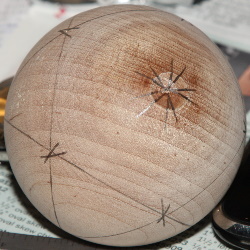 You can also refine the lower 5 points by marking an arch from each of them to the others while you have the compass set to find the lower end grain point. 8 Label the lower end grain point #2. Label each of the points around #1 as 3 through 7. Label each of the points around #2 as 8 through 12. This completes the layout of the 12 primary points. Notes - Once you get the hang of it, this goes very quickly. I draw a full circle from point #1 but then only mark arcs from each of the other points. It makes clean up a little faster. I find it best to work from one end grain point towards the other. That way the series of arcs that find point #2 shows me how round my ball is and how accurate my points are. 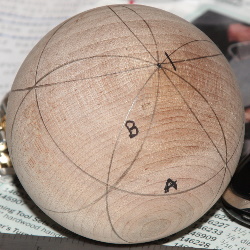 Find and mark the 12 primay points on a 2-1/2" sphere. Erase any circles left from finding the 12 primay points, keeping the points you marked. This will make it a little easier. Set your compass to 13/16" (0.32 * 2-1/2"). Mark a circle from each primary point. The intersections of these points are the 20 Constellation points. You'll need to fudge the points a bit as you did with the 12 primary points. Mark them, but numbering them isn't important. Projects using the 6 main points provide a whole new perspective on what's possible. They're often cut with a larger radius and may require a modified 'fence' on the cutter's holder so that its wide enough to cross the wider gap. 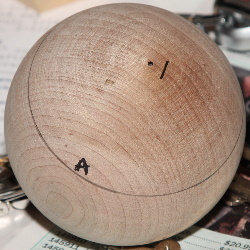 Find the most obvious end grain point of your 2-1/2" sphere. Mark it as #1. Set your compass to 1-3/4". This is the radius of your sphere * 1.414. Mark a circle from point #1. This should be the equator of your sphere. Let's call this circle A. From any point on circle A, mark circle B. Circle B should cross circle A twice. Mark the 2 points where circle A and B cross as point #3 and point #4. From point #3 or #4, mark circle C.
At the 2 points where circle C crosses circle A, mark point #5 and point #6. At the point where circle B crosses circle C, mark point #2. Note that points 1 and 2 are both end grain points and should probably be worked first. I think the orginal purpose of the 8 clearance points had to do with the reaching of the hollowing tool to the center of the point furthest from any 3 main points. That's certainly still a valid reason for using them, but don't let it constrain you. 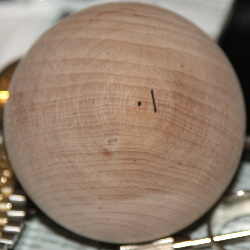 Find and mark the 6 main points on a 2-1/2" sphere. Erase any circles left from finding the main points, keeping the points you marked. This will make it a little easier. Set your compass to 15/16". This is the radius of your sphere * 0.765. Mark a circle from each main point. The intersections of these points are the 8 clearance points. You'll probably need to fudge them just a bit to get the pefect. Mark them, but numbering isn't important.